Dundee Electrician » Pulse Electrical (Dundee) Ltd.
Pulse Electrical (Dundee) Ltd. provide a completely free, no obligation quotation service. All installations, repairs or services will be fully itemised so the customer knows exactly what they are paying for without any surprises. » We have a strong team of professional electricians who are retrained regularly, learning the latest regulations. » We are regularly inspected by our national accreditation bodies, constantly retaining our memberships. All works carried out by Pulse Electrical (Dundee) Ltd. are covered by a full 1 year warranty. We are a customer focused company and endeavor to provide a 100% reliable service. 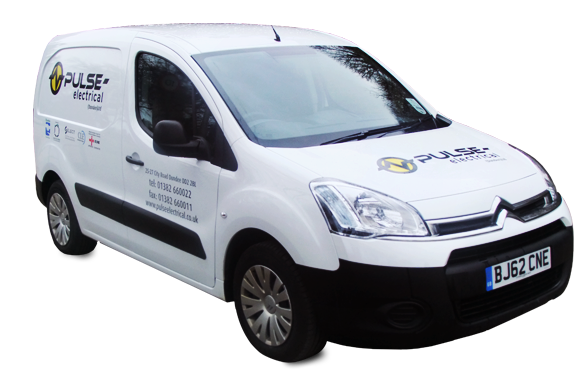 I have engaged the services of Pulse Electrical on numerous projects, from full re-wires to complex fault finding. I find their breadth of knowledge, expertise and quality of workmanship first class. Pulse Electrical (Dundee) Ltd – An Electrical Contractor providing electricians for commercial, industrial and domestic works throughout the wider Dundee area. Please feel free to contact our office to discuss your individual requirements.